Lake Garda, set in picturesque mountain scenery, offers water sports of all types, and on the Sirmione Peninsula you can tour a most unusual 13th century castle that seems to rise from the bottom of the lake. Hike the Dolomites in the summer and ski them in the winter. Andrea Palladio, the region's great architect and from which the "Palladium window" received its name, has splendid villas dotted throughout the region, many of which are open to the public. 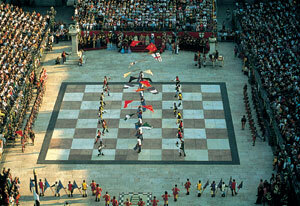 Veneto is made up of seven provinces, located in three areas known as The Veneto Plain, The Lake Area and The Dolomites. The Veneto Plain holds the well known cities of Padua, Vicenza and Treviso, not to mention one of the greatest destination cities of the world, Venice. The plain sweeps from the Po River delta in the southwest to the mountains that form the border between Italy and Slovenia to the northeast. This fertile land is best known for agriculture. 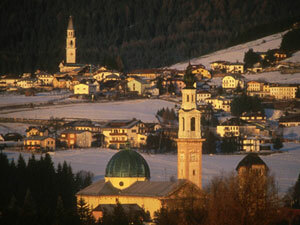 While the valley is flat, its architecture reaches vertically, with skyscraper church towers and 14th century stone castles, all with a 6,000 foot backdrop of the snowcapped Dolomites. You can easily spend a few days here exploring the quaint medieval and Renaissance towns such as Maròstica where the city hosts the Partita a Scacchi - a human chess game held every other year since the time of the Renaissance. Buy hand painted vases, plates and bowls in the town of Bassano Del Grappa and textiles and jeans in Thiene. Enjoy the picturesque views of cypresses and vineyards from the narrow streets of Asolo. Drive the White Wine Road from Valdobbiadene to Conegliano and visit the many vineyards that produce Prosecco, one of Italy's best loved sparkling wines. Visit the Romanesque frescoes in the church in San Pietro di Foletto. Walk the streets of Vicenza, known as the city of Andrea Palladio for the many magnificent villas and palaces he designed there. 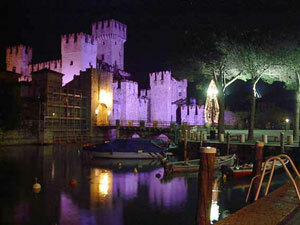 BC, this fairy tale castle stands guard at the base of the Sirmione Peninsula. The castle seems to rise up from the bottom of the lake and is almost completely surrounded by water and appears to float next to the town it guards. Of course, there are many water activities including sailing, wind surfing. Yacht harbors and beaches line the shores. Take a ferry between villages for the best views of the lake or ride a cable car in Malcèsine that will take you up to the summit of Monte Baldo where you can hike the many nature paths or just enjoy the view. 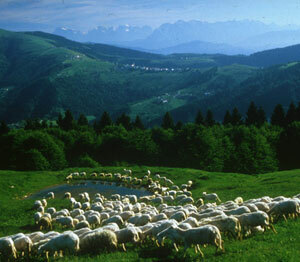 The Dolomites, rising 6,500 ft., are the foothills of the Alps. There are many nature reserves in this area and breathtaking scenery. You'll hear both Italian and German spoken here, reflecting Italy's strong ties to Germany dating back to the time when it was ruled by the Hapsburgs until World War I. The Tyrol flavor of Austria is evident as you wander through this area; cattle grazing in lush meadows herded by children in Lederhosen, alpine villages made of wooden houses hidden in steep valleys, Austrian influenced onion-shaped domes on Italian churches, restaurants where menus are in both Italian and German and sauerkraut and polenta are both offered. In the winter, Italy's top ski resort, Cortina d'Ampezzo which was host to the 1956 Olympics turns into the winter playground for film stars and royalty. You can enjoy not only downhill and cross country skiing, but also bobsledding and ice skating. There also are indoor tennis courts, swimming pools and riding stables and for the more adventurous, a ski jump. The food of this region is just as diverse as the landscape. It is a combination of sea and land and is influenced by the history of being a major trading port with the East and the close Austrian ties. Polenta was born in this region, and served with every meal plain, grilled or fried, as an accompaniment to meat, fish and wild game. Treviso is known for the radicchio and tiramisu. Bassano del Grappa is known for the powerful drink named after the town and its succulent white asparagus that rivals the French. Every Venetian family has their family recipe for a thick bean soup called pasta e fagioli. Veneto is also known for their excellent wines, the semi sweet sparkling Prosecco, the robust Amarone and the medium bodied Valpolicella.